Does this sound familiar? You write an amazing piece of content, making sure to craft an attention-grabbing headline. Then, you share the link on Twitter, Facebook, even Google+. Then you wait in breathless anticipation for your share count to skyrocket. Except it doesn’t. Never fear, in this article you’ll find fresh ideas to generate buzz and get your posts noticed. Everyone is using Twitter, Facebook, LinkedIn and Google+ to promote their content. It’s tempting to focus only on these four networks because they have popularity and community numbers on their side. However, you get a competitive advantage when you share your content on smaller or less well-known networks. These sites often have active, focused audiences and offer less competition for attention, so your content will stand out. Reddit—Dubbed the “Front Page of the Internet”, Reddit is a social news aggregation, web content rating, and discussion website. Members can submit content to the site such as links, text posts, and images. If you have a niche, there is a subreddit dedicated to it. Tumblr—A microblogging site that made headlines when Yahoo! acquired it. Its user base tends to be younger and more “hip,” making it the perfect platform to share edgier, niche-based content. Sharing a link to your post isn’t enough to guarantee that it gets read. You need to give users a compelling reason to click your link. Use one or more of these outside-the-box, creative methods to promote your posts with images, audio and video. Available for iPhone and Android devices, Anchor offers a simple way to record audio on your phone, and then share it with other Anchor community members. Anchor brings the simplicity and fun of audio to the social world. Record your voice, add a transition and share with your friends. The app includes voice filters and lets you add a profile image and url. Spark interest in your blog post and record an audio message that communicates your excitement and passion about the content in a way that text or static images can’t. Enter your blog post URL in the description and you’ve got a ready-made sound bite that can be shared with the Anchor community, as well as Facebook and Twitter. Add a link to your blog post. Record your teaser audio and share. SlideShare is more than a just a content-sharing platform. With over 80 million visitors, SlideShare is a thriving community with five times as much traffic from business owners than Facebook, Twitter or LinkedIn. 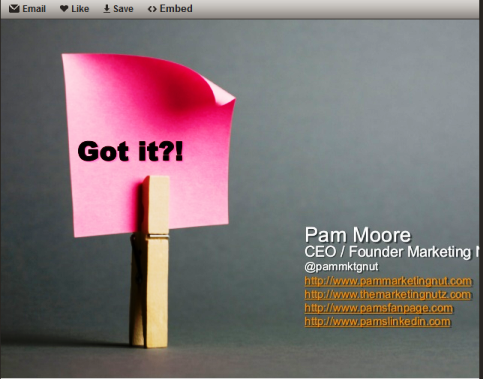 A presentation by Pam Moore, the Marketing Nut, demonstrates the cross-promotional opportunities between SlideShare and her blog. In this example, Pam created an overview of her blog post with the slides and then included a link back to her post in one of the presentation slides. At the end of her post, she embedded the presentation, which links back to SlideShare and more of her content. Pam put her links at the end of her presentation on her closing slide. Your finished presentation will be visible and searchable from within SlideShare and you can extend its reach and share it to Facebook, Twitter, Google+, Pinterest and LinkedIn. Pro Tip: Twitter doesn’t display the actual Instagram link. Instead, it links to the image. You can use IFTTT to circumvent this issue. Here’s the recipe. With the most recent update to Facebook’s algorithm, the so-called Facebook Apocalypse, marketers have been put on notice that news feed reach will decline even further. The days of sharing a link post and garnering massive referral traffic are over. You will need to be much more innovative in your approach to getting the attention of readers. While video watch times are predicted to decrease, Facebook Live video is still a reliable method of ensuring you show up in the news feed. Take this opportunity to give a summary of your blog post, highlighting the key points…or do the exact opposite. Use Facebook Live to dive deeper into the content and really flesh out the concepts. The interactive nature of Facebook Lives lends itself perfectly to an impromptu Q & A session or AMA. To go Live, simply navigate to your profile or page on desktop or mobile and click “Live Video”. However, if you go live from your mobile device, you will be given additional options, such as including a friend in the video, using a mask, adding gifs and playing This or That. In the past year, messaging apps (Messenger, Whatsapp, WeChat, Viber) have surpassed social networks. The predicted growth of social messaging apps highlights a change toward more personal, one-to-one communications, as opposed to the one-to-many broadcast model of the past. It used to be that when you published a blog post, the most expedient method of getting it out to the masses was to send out an email. And that may still be the case, but to challenge that thinking, Hubspot ran a test and came back with some shocking results. They gave a group of respondents the option of receiving they blog updates via email or via Facebook Messenger. After four weeks, they had a winner: Facebook Messenger. Facebook Messenger resulted in a 242% higher open rate and a 619% higher click rate than email! Content Delivery System – Use your Messenger list like an email list and share new content when it is available. Content Discovery System – Use your Bot to help your Facebook fans discover content on demand through interactive search. There are many other creative ways to promote your blog post. Don’t be afraid to try something new! Just because no one else is doing it doesn’t mean it’s not a good idea. Some tactics will resonate with your readers. Some will not. And that’s ok. The important thing is to keep innovating. What do you think? Have you used any of these creative alternatives? Do you have another, outside-the-box idea for promoting your blog posts? Please let me know your suggestions in the comments below. Very clever ideas! 4 of the 5 I have never even tried (yet). I’ll be sure to pass them along. Thanks Andy! I appreciate you taking the time to comment. A couple other ideas would be to go live on Periscope with a preview of your blog post or even to turn it into a PDF and submit it to PDF submission sites.